We are currently accepting applications for the DEG Preschool Scholarship. The scholarship is given in memory of Diane E Guenther, who was an active member of the Medina Preschool PTA who lost her battle with cancer.The DEG scholarship is open to all Medina County families whose child would not be able to attend preschool or has been forced to terminate or restrict attendance due to financial hardship. 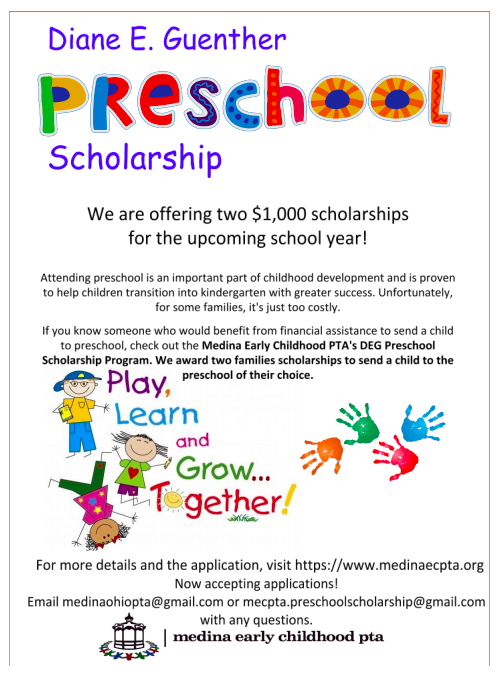 We are proud to continue this outreach program and are excited to be awarding (2) $1,000.00 preschool scholarships. If you or if you know of an eligible family whom might be interested in such assistance for the 2019-2020 school year, we are currently accepting applications. Applications are due April 15, 2019. Printed and sent through the mail: DEG Paper Application 2019-2020. All applicant information will remain strictly confidential. We expect to award the scholarship by the end of May and payment will be made directly to the family’s chosen preschool. Please feel free to contact me if you have any questions.